Click chart for more on Bank of America. NEW YORK (CNNMoney) -- Bank of America said Monday that it plans to eliminate 30,000 jobs as part of a plan to save $5 billion. The bank said it expects a "significant portion" of the reduction in headcount to occur through attrition and the elimination of unfilled positions. BofA had a total of 287,000 employees as of June 30. The move, part of an ongoing reorganization launched last year called the "Project New BAC," will play out over the next few years. In the first phase of the plan, BofA said it expects to save $5 billion, or 18% of its projected $27 billion in overall costs, through 2014. The second phase will begin in October and run through 2012. The cost reductions stem from changes BofA has made in its consumer and small banking business, credit card operations, home lending as well as global operations and certain support areas. "We're a much simpler company than we were 24 months ago," Moynihan said. Shares of BofA (BAC, Fortune 500) rose 1.3% in morning trading. 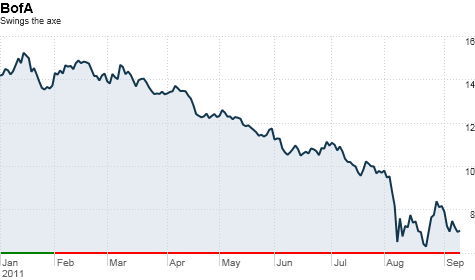 The company's stock has taken a beating this year, tumbling about 48% from January. Moynihan said the company will continue cutting costs as part of a plan to refocus on its core businesses, but he declined to provide details on future reductions. Moynihan acknowledged that BofA faces a challenging environment, pointing to the weak economy, low interest rates and the bank's troubled mortgage unit. But he stressed that BofA has been focused on building "a fortress balance sheet" to help offset any future losses. It has been doing that, he added, by "getting out of the things we don't need to do." The bank has been struggling to tamp down widespread speculation in financial markets about potential legal costs and loan losses in its mortgage unit, which has been the worst performing of its six business lines. BofA announced an $8.5 billion settlement earlier this year with 22 of the nation's largest fixed-income investment firms over mortgage-backed assets. The assets in question stem from BofA's purchase of Countrywide Financial, once the nation's largest sub-prime lender, in 2008. The settlement, which has yet to be approved by the courts, is being challenged. When asked if the bank would consider bankrupting Countrywide, Moynihan said BofA is "looking at all options." But he stressed that the company would not discuss such plans publicly. Meanwhile, BofA is also being sued by state and federal regulators for questionable foreclosure processes. BofA is one of 17 major U.S. financial institutions that are being sued by the federal agency overseeing Fannie Mae and Freddie Mac in an attempt to recover billions of dollars in losses from risky mortgage investments. Moynihan said resolving the lawsuits "could help move us forward." But he added that the settlements "must be reasonable for the company and the shareholders." He also discussed the economic challenges facing the company, as lending activity continues to decline and interest rates remain near record lows. To deal with these challenges, Moynihan said the bank is focusing on its "core" businesses, including its retail and commercial banking operations, as well as private wealth management. Moynihan also argued that BofA has improved its capital position and reserve levels following recent asset sales. In the third quarter, BofA sold part of its stake in China Construction Bank and agreed to sell its Canadian credit card business. It also received a $5 billion investment from Warren Buffett's Berkshire Hathaway (BRKA, Fortune 500). Moynihan said BofA was not pressed by bank regulators to raise capital at the time of Buffett made his offer. "We are very pleased with the investment and it has had a great impact on our company," he said. "It was absolutely right thing to do for us at the time."